The rumours were, that with the sunset of Magento 1, the users of free open-source Magento Community edition, i.e. the vast majority of eCommerce website stores powered by Magento, would be left without support and security patches. This misconception was caused by the fact that, speaking about the support of their customers, the Magento team was often focused on Magento Enterprise, the ecommerce website platform, coming with significant licensing fees. So while the Magento Enterprise Edition users were assured that they would continue to get the support they’re paying for, the non-paying customers of Magento 1 started to look closer at the differences between Magento 1 and 2 and ask themselves, “should i upgrade to magento 2x”? While the Magento officials withheld the comments on the matter, their partners were trying to comfort the anxious community. We’ve also been told to anticipate that any security patches put out for Magento Enterprise Edition will include support for Magento Community as well, so Magento CE users should not feel like they may get left behind while Magento EE users continue to receive patches. Finally, the Magento team filled in this gap in their official blog. Among other hot topics, mainly around magento 2 benefits (like Magento 2 enterprise features and Magento 2 community feature lists, Magento 2 performance optimisation and other) they lifted the veil on the details of their policy in regards to support of Magento 1 CE after Magento 1 sunset. Magento 1 has been and will continue to be supported for the foreseeable future. We have no intention of denying access to our world-class software. We’re committing to a minimum 18-month notice before we make any changes to our support levels. Nevertheless, the sunset of Magento version 1 is inevitable, so let’s study the difference between magento 1 and 2 as well as advantages and disadvantages of Magento 2. Checkout process has been streamlined. The first thing a customer now sees on checkout is the default guest checkout screen prompting to enter an email address. If it matches an existing customer, they can checkout faster with the previously saved information. Guests are encouraged to create an account in one click from the order Thank You page. for guest checkout the increase in speed is even more palpable, it has become 38% faster. One can customize the admin panel to access all the most important business information quickly. The admin panel has become touch-screen friendly to manage your eCommerce store on the go. Magento 2 got the ability to add Youtube and Vimeo videos in product descriptions. They forecast an increase in sales from 6 % to 30 % thanks to this feature. 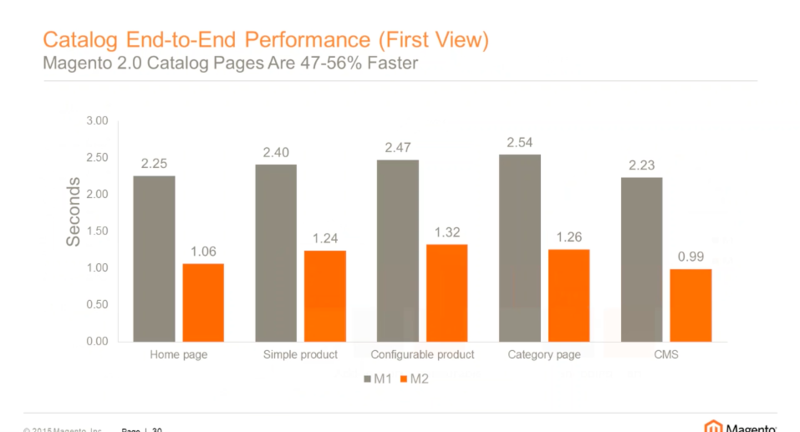 Magento 2 itself, thanks to code improvements, runs around 20% faster than Magento 1.x. Support for PHP 7, bringing huge performance boost and reduced memory consumption, gives up to 90% increase in speed (!!!) additionally. MySQL Percona that is much faster and more scalable, easier to monitor and tune, may contribute into the better performance too. CSS3 and HTML5 standards for theming, LESS support, JS Prototype replaced with jQuery – these are major frontend design related changes. Besides, there are two new fully-responsive default themes “Blank” and “Luma”. They are recommended as a starting point for developers. Magento 2 has automatic testing aimed at improving the code quality and speeding up the QA process. The Magento team encourages you to use Selenium Grid when you’re developing a new Magento 2 based project. Parallelize functional testing and use the full suite at least once a day. There are 5 root directories instead of 9. Most of your working files have been reorganised. Everything is now moved into the “app” file, except config.xml where you register your custom module. Further, you will notice the removal of the skin directory. Every module has its own /view directory where the template, layout, JS, CSS and LESS files of this module are stored. Thanks to Inchoo, there’s a good overview of Magento 2 frontend theme architecture. Last but not least, starting from Magento v.2.0 it can run from the /vendor directory, starting from 2.1 – run from any arbitrary directory. All the above is definitely a huge step forward for those who decided to start an online store. As for migrating, well, Houston, we have a problem. Extensions require a full rewrite. Simple copying the code won’t do the trick.You will have more success settling yourself in a comfy chair and rewriting Magento extensions from scratch with your tongue sticked out, following the new Magento development guidelines and overcoming a remarkable learning curve…and that’s one of the strongest Magento 2 disadvantages. 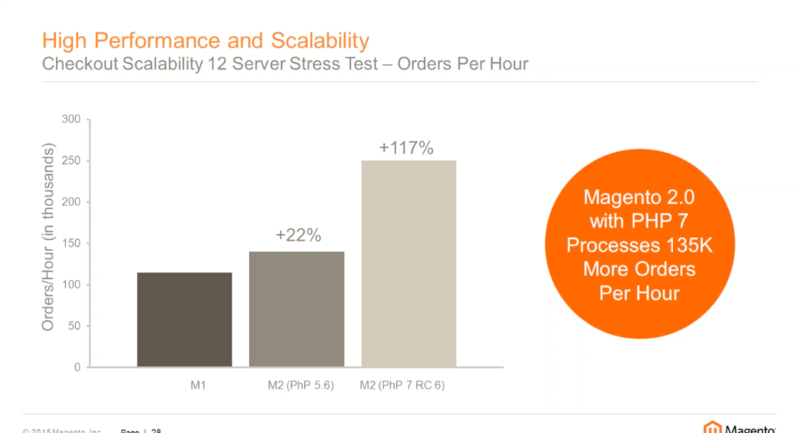 In Magento 1.9 vs 2.0 performance comparison the latter wins thanks to the support of PHP 7, MySQL Percona, overall code optimization as well as one more great Magento 2 feature – full-page caching. It means that the Magento eCommerce store pages load 1 – 2 seconds, and compared to 5 – 10 seconds for non-cached pages, that’s a huge win in speed. Moreover, Magento v2 supports Varnish Cache out of the box and it would be a sin not to reap a benefit from it. Reading all the above you may ask, how the Magento community feature list looks like. Are they Magento Enterprise Features only or will the users of CE be able to enjoy all the advantages of Magento 2? Given the Magento Enterprise price varies from $22,000.00 to $125,000.00 per year, and their hosted Enterprise level solution Magento Commerce is even more expensive – $40,000.00 – $190,000.00 per year (the official website does not clearly state it, so I had to look for Magento 2 pricing in the alternative sources and found these figures here), this summary needs clarification, as the customers want strong reasons to pay up. This feature of Magento 2 EE enables you to use three master databases (for orders, checkout and product data) plus a customizable number of slave databases responsible for replication. Since the MySQL database replicates asynchronously, slave databases don’t have to be permanently connected for receiving master update. Moreover they support data backup, scalability, and data analysis which does not affect the master database, making the entire system pretty reliable. Just to compare, Magento 2 Community Edition incorporates only a single master database. Magento 2 EE got Solr and Elastic Search to make the on-site search more powerful. However Solr is deprecated in Magento 2.1 and will not be supported in 2.2. So the Magento developer guide advises that you use Elastic Search instead, a newer and more popular search technology. The users of CE who want to utilize this technology may purchase one of 3rd party extensions, Magento 2 ready, for about a hundred bucks. Starting from Magento Enterprise v.2.1, there appeared a feature every content marketer will love. Content Staging and Preview. The admin can make changes to the site and preview how the site will look (with full browsability) at some point in the future without having to publish the changes live. Magento 2 EE users may utilize Message queues powered by Rabbit MQ, a messaging broker used for sending and receiving message,as well as storing undelivered ones. There also appeared the ability to manage customer attributes and create custom customer attributes. Based on these attributes, you can flexibly segment the customers and give promotions to a specific group of customers only. The feature is also handy for merchants who manage several eCommerce stores and need different attributes for each. In Magento 2 CE, you still can add other than default Customer Attributes, but you have to buy an extension. The tools to achieve the best customer loyalty are included into Magento 2 EE too: Rewards Points, In-Store Credits, Gift Registry and Gift Cards, Private Sales with Invite-a-friend option, Bulk Ordering, Recurring payments. Most of these features (probably, not exact copies, but still close to the original) are available for CE as paid extensions from partners with an average price of $149-$199. Rules-based Related Products, Up-sells and Cross-sells, say, depending on the average totals of past orders will make user experience more personalized, yet requires a more sophisticated configuration and smart marketing skills. The “plain” Up-sells and Cross-sells are a prerogative of Magento 2 Community Edition customers. Another Magento 2 EE advantage is the scheduled FTP/SFTP transfer via XML, useful for managing very large catalogs and inventory updates in a more performant manner than bulk API calls. This tool by Google is available in EE out of the box. It gives you the ability to add and update your tags placed into the website for conversion tracking, site analytics, remarketing. It supports a large range of Google’s own as well as 3rd party tags like Kochava, Crazy egg, ComScore, Tune and dozens of others. Last but not least, dedicated 24/7 support and a dedicated account manager – this is the privilege of paying users of Magento 2. Now that you know, what is new in magento 2, have some kind of Magento 2 features list and understand the difference between magento 1 and 2, you may consider upgrading from version 1 to version 2. So, how do I upgrade Magento, say, 1.9.2 to 2.x? Because of huge changes in files and database structure, moving from Magento 1.x to 2.x is actually a migration, not an upgrade. The data has to be exported and rearranged to comply with the new database tables/columns. A special tool will help. It verifies the consistency between Magento 1 and 2 database structures, tracks the progress of data transfer, creates logs, and runs data verification tests. Migrating images and other media files must be done manually. The files and directory structure as well as internal operations of Magento 2 differ so much that if you use any custom extensions ( and who doesn’t? ), you will need to have your modules rewritten. Same applies for themes and templates. 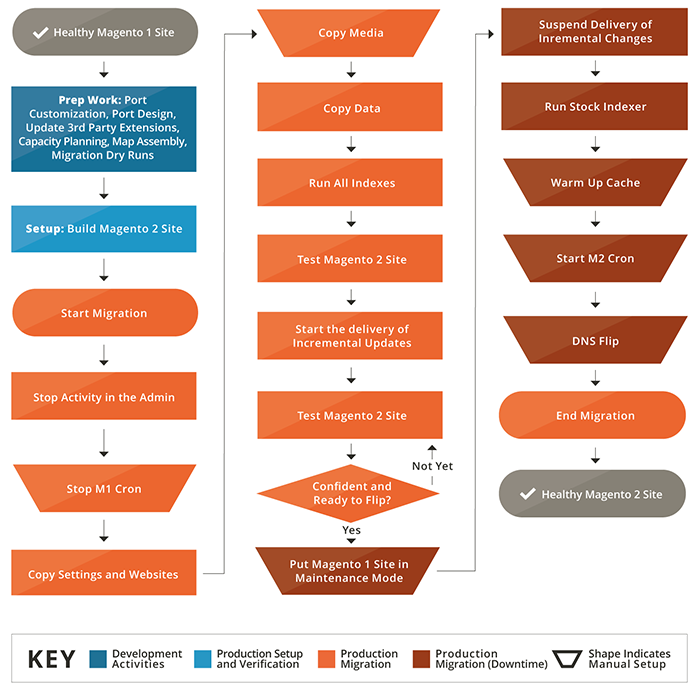 The good news is that Magento team has rolled out the Code Migration Toolkit, aimed at helping you to port your extensions and custom code to Magento 2. The bad news is that even the rough estimation shows that an average Magento 2 migration is “about 20% larger than a Magento 1.x upgrade” [quote source: official Migration guide]. Basically, you will keep running the old eCommerce website powered by 1.x version on your production site . At the same time you will move your data to the 2.x version running on a dev server , reimplement your addons, custom themes and features from scratch, than test until you think it’s ready. After that you will close your live storefront, synchronize your data with the live store, test again and replace the old store with a new one. Easy to say, but hard to do, yeah. At least 20% harder than you’re used to ( if only you have ever upgraded your Magento 1 store already). Speaking about Magento 1 vs Magento 2 in 2017 and having a list of Magento 2 killer features on file, we can not ignore such an important point as Magento 2 disadvantages. The list is not too long, yet they do exist. First of all, not every single extension is Magento 2 ready. But even if they are, you are expected to repurchase them. Thus, extra expenses will appear regardless, be it a purchase of ready-made module or integrating it anew. Besides, this process can be quite a hassle if you are at least a bit selective and search only for trustworthy providers and qualified modules. Furthermore, Magento 1 themes cannot be transferred to Magento 2 with a wave of a magic wand, and it goes without saying that they are not compatible by default. You have to build them from scratch or find some replacement. Magento developers used to working on Magento 1 will need to upskill. If you decide to move forward with this switch, you might need to wait until your developer is feeling confident – or find a better (and more expensive, maybe) developer. Magento 2 system requirements are such that it requires a professional admin for administration, thus merchants must invest more money into both the server itself and its maintenance. To enjoy the top features you need Magento EE, the proprietary software which requires a paid license. It costs $22,000.00 – $125,000.00 per year. Moreover, if you choose Magento Commerce, that is a Magento-hosted cloud Enterprise solution, be ready to open your purse – $40,000.00 – $190,000.00 per year, depending on the size of your business. [Source] OMG, up to almost $200K for a license only! Magento 2 is new, it’s not an evolution of Magento 1 but an independent brand-new product with new technology inside, even though created by the same team. As in any new software, it’s going to take some time to work the bugs out and make the product stable -and trusted!- enough for production eCommerce stores. The answer really depends on your current site and its condition, on the version of Magento you run. If it is running well and the orders are coming, if it uses the version that’s not too outdated (say, anything older than 1.8 CE IS quite outdated), there is no rush, you may take a blue pill. If as a user of Magento 1 you’re thinking about the differences between Magento 1 and 2 now, probably it’s the perfect moment for you to you evaluate whether Magento is still the best ecommerce platform solution for you. It will anyway be a migration, a complex and time-consuming process, so you should absolutely consider what other ecommerce solutions are available as there may be a more efficient solution fitted for your store’s needs. Some of its best alternatives are Shopify, or X-Cart, or Prestashop. Before you read further, I would like to say that I have a great deal of respect for this amazing eCommerce platform. Magento is one of the top players on the market. Not for nothing do thousands of loyal customers around the world choose Magento 1 or 2. Yet, it doesn’t suit everyone. Some users are fed up with Magento performance issues, others are getting tired of waiting for bug fixes in CE edition, that take years. The third group of former Magento adepts found out that while Magento was the obvious choice several years ago, right now there are dozens of other platforms that are pretty competitive and meet their needs better. That’s why It’s not uncommon to leave Magento for another eCommerce website builder. If you have ever had such an intent, now when Magento 1 sunset is coming, it is the perfect time. At least – a perfect time to look around and notice a couple of Magento alternatives that may work better for your business. Here Shopify (and Shopify Plus for Magento EE users), Prestashop, Opencart and X-Cart come to my mind. Spoiler: further goes the text why X-Cart 5 rocks. It really does, if you’re interested – keep reading. If not – drop here and please do me a favor to leave a comment or two under this article – did you find it informative and useful? Why to switch to X-Cart 5? Being a proprietary software available at affordable cost, X-Cart beats both the best free ecommerce platforms and the expensive enterprise ecommerce platforms. Studying how X-Cart 5 compares to Magento 2 deserves a separate article, so here’s a short overview. 24/7 premium support. Paid, included in the top plan. it’s has both a hosted and an on-premise solution with equally high degree of customizability, (100% access to code in both cases) and the price of vendor-hosted solution is not sky-high. Icing on the cake, there’s a special offer for Magento EE users: we offer a FREE data migration if you move to X-Cart Enterprise.